The office furniture production in India reached a total value of USD 1,702 million, showing about 4% growth compared to the previous year (+14% in local currency). Production increased by four times over the last decade and the average growth in the period considered (2007-2013) was +8% in USD. Consumption of office furniture showed a good performance driven by a general improvement of the economic situation in the country and as a result of a growth in the industrial and services sectors. non-residential construction activities performed very well, leading to an expansion of office premises and space. about 62% of imported goods are represented by office furniture, while the remaining 38% is covered by office seating. MOBILE OFFICE IS THE TREND the trend is moving towards the mobile office. unlike in the past times, when each person used to work at his/her own workstation, nowadays anybody can go and work on any available workstation in the office, and the trend is towards a shared office scenario, where people are travelling or working at home. actually, office is everywhere. Some large Corporates already have been moving in that direction and, accordingly to key experts, it is definitely the future of the office furniture in India. 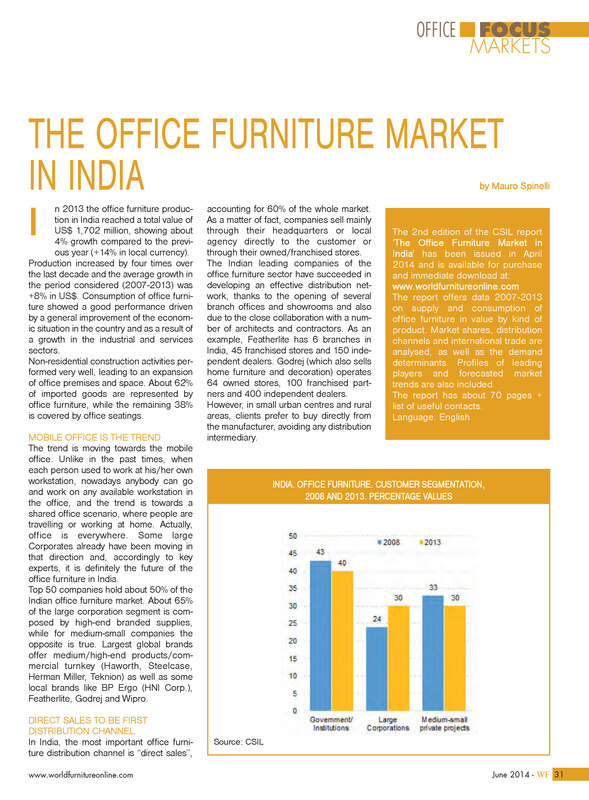 top 50 companies hold about 50% of the Indian office furniture market. about 65% of the large corporation segment is composed by high-end branded supplies, while for medium-small companies the opposite is true. Largest global brands offer medium/high-end products/commercial turnkey (Haworth, Steelcase, Herman Miller, Teknion) as well as some local brands like BP Ergo (HNI Corp.), Featherlite, Godrej and Wipro.